To view all homes for sale in all of the Lone Oak communities, click the button on the right. To the north of Oklahoma City proper lies the popular suburban city of Edmond, OK, home to many residents that enjoy the opportunities afforded by life in Edmond. 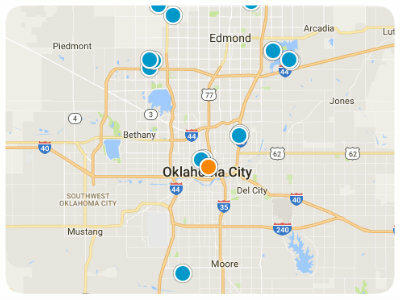 Edmond has long been a favored suburban area of central Oklahoma, and the surge in the population of the Oklahoma City metro area in the past few decades has led to the construction of wonderful master-planned communities in the region. One such community, Lone Oak, finds itself at the frontier of suburban development, offering brand-new homes to homebuyers who want to live in this exciting area. Lone Oak, Edmond, OK houses for sale offer a perfect blend of a secure, suburban neighborhood and convenience to the many attractions of Oklahoma City. These larger homes tend to offer three car garages, four bedrooms, and two-and-a-half bathrooms. The most expansive homes in the Lone Oak area tend to be listed at price points just below $300k, and the most modest homes tend to be listed at price points in the low $200k range. As the community is set on the current frontier of suburban development, residents of the Lone Oak communities will find that they have plenty of opportunities to enjoy the beautiful natural landscape that surrounds their homes. For those who want to have a more in-depth experience with central Oklahoma’s gorgeous outdoor environment, Edmond is near to numerous settings for outdoor recreation. The city itself hosts wonderful park lands, recreational facilities, and golf courses. For those seeking more adventure, the Martin Park Nature Center offers hiking trails through wilderness settings. Residents who enjoy waterborne recreation have their choice of a host of nearby recreational lakes to enjoy. Among the most popular are Thunderbird Lake and Lake Stanley Draper, both of which are favored locations for swimming, motor boating, sailing, fishing, jet skiing, and water skiing. On the banks of these lakes are trails favored by campers, hikers, and backpackers. Located in the up and coming area of western Edmond, the real estate for sale in Lone Oak, Edmond, OK lies in two adjacent neighborhoods, Lone Oak Park and Lone Oak Lakes. Located along the stretch of Lone Oak Drive that spans from Northwest 164th Street to Northwest 150th Street, these neighborhoods are among the first in this exciting area, and in fact, both Lone Oak Park and Lone Oak Lakes are home to a selection newly-constructed houses and yet-to-be-built homes. The community features two gated entrances, as well as a large greenbelt that extends along a waterway which winds along the side of the community. Lone Oak Park is located at the junction of Northwest 164th Street and Lone Oak Drive. Lone Oak Park is also home to a community area and numerous parks and playgrounds. Just to the south, Lone Oak Lakes lies along Northwest 150th Street. Homes in these neighborhoods are typically three and four bedroom floor plans, and fall within the 1,800 square foot to 2,700 square foot range. Most lots are around one-fifth of an acre in size, and many have private pools or hot tubs in the backyard area. 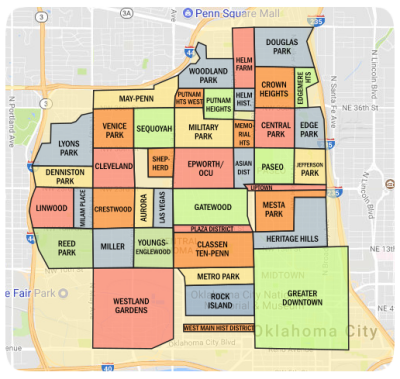 Some homes in the Lone Oak Park neighborhood are somewhat larger, spanning over 3,000 square feet on quarter-acre lots. Residents who prefer a more refined cultural experience will not be disappointed with the offerings in Oklahoma City, just a short drive to the south. The state capital offers numerous museum and cultural attractions, including the Civic Center Music Hall, the Gaylord – Pickens Oklahoma Heritage Museum, the Cox Convention Center, the American Indian Cultural Center and Museum, the Oklahoma City Zoo, the Oklahoma City National Memorial and Museum, the Oklahoma City Museum of Art, and the Oklahoma History Center.